Follow us on Facebook and Twitter. Post something on our Wall or send us a Tweet and we'll be in touch shortly. We love interacting with our customers, making new friends, and sharing what we've learned. MHS Technologies' showroom is centrally located in Newland, NC off Hwy 194. Our regular hours are Monday through Friday 7:30 am to 4:00 pm. Outside regular hours and on weekends our sales staff is available by appointment. Additional Sales Staff is available in our Boone, NC office. Call for an appointment. Our knowledgeable and friendly staff would love to hear from you. Contact us at (828) 733-0141 or anytime online. What could be easier than the press of a button? If you have a sophisticated home automation system installed by MHS Technologies, a simple button press on a touch panel, keypad, or even your smart phone is all that is required to control any or all of the electronic systems in your home. Making the complicated easy is our goal! The terms “integration”, “smart home”, and “home automation” have evolved in recent years to cover a broad range of meanings and products. 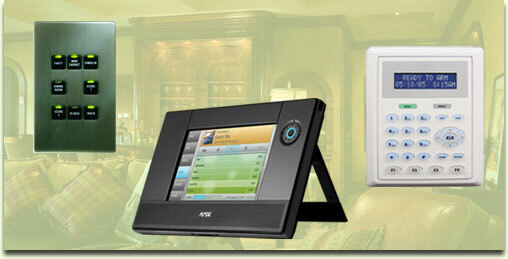 We categorize home automation products into two levels. The first are products and systems that by themselves perform a specific function but also contain automation features. This category would include advanced alarm systems that are controllable via your smart phone and sophisticated universal remote controls. The second and more involved category consists of products designed solely for the purpose of integrating and controlling home systems and electronics. AMX and Control 4 are two leading companies that manufacture intelligent controllers and stylish touch panels that give you a single source of control over your home’s electronics. Once your home automation system is installed, the real power comes from the programming. A personalized sequence of Events can be triggered by the user or by one of the other systems. For example, the security panel detects one of the garage doors opening and signals the AMX controller. Since it’s between 5-6 PM on a weekday, home from work, AMX tells the Lite Touch System to light the path to your favorite easy chair and has the television already tuned to your favorite show when you arrive. Another example, before bed time, a single button press on a wireless keypad turns all the common area lights off, makes sure all the Audio/Video equipment throughout the house is shut down, and arms the alarm. The only limitation to the Automation systems personalized programming is your imagination. Our 35 years of experience, starting with GE relay lighting control in the 70’s through today’s most advanced automation systems, guarantees that we can successfully lead you through the process of designing and installing your automation system. With Lite Touch, AMX, Control 4, Elk Products, and many other industry leading products, we have what it takes to get the job done. MHS Technologies is your one source for all your automation needs. Our Gallery contains many pictures of our automation products and installations.